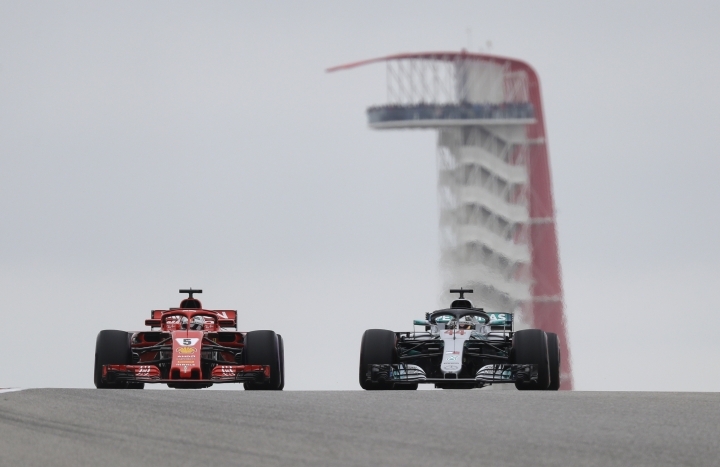 AUSTIN, Texas — Lewis Hamilton warned Ferrari and championship rival Sebastian Vettel would be ready to "punch back" at the U.S. Grand Prix after recent poor results. He was right. 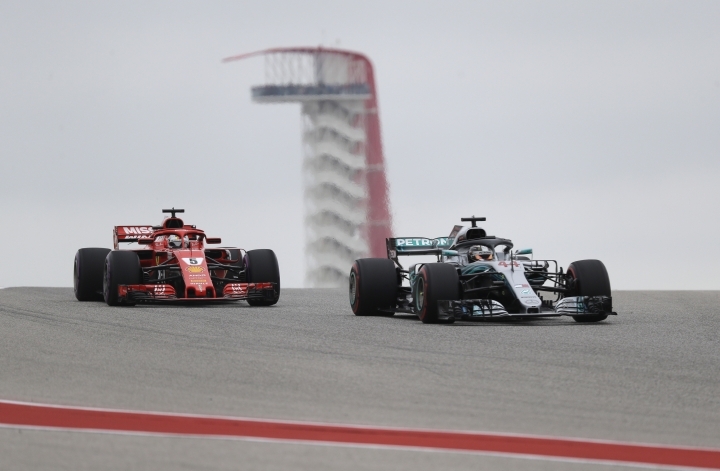 It's just that Vettel may be too far back to land anything strong enough to deny Hamilton a fifth Formula One championship. 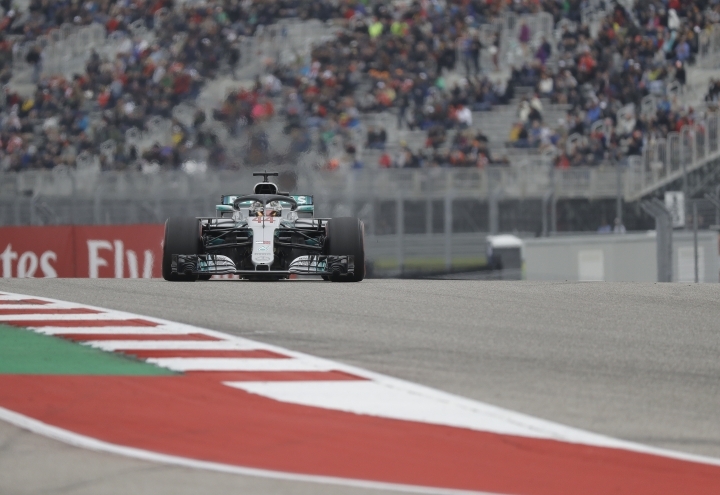 Hamilton drove his Mercedes to his 81st career pole position with a blistering track-record lap of 1 minute, 32.237 seconds at the Circuit of the Americas on Saturday. Vettel was just .061 seconds behind. But instead of starting Sunday's race from second with a real chance to make it a fight, Vettel will start from fifth because of a three-spot grid penalty issued Friday when race officials said the German drove too fast while under a red flag in a practice session. That gap could be just big enough to guarantee Hamilton wins the season championship. 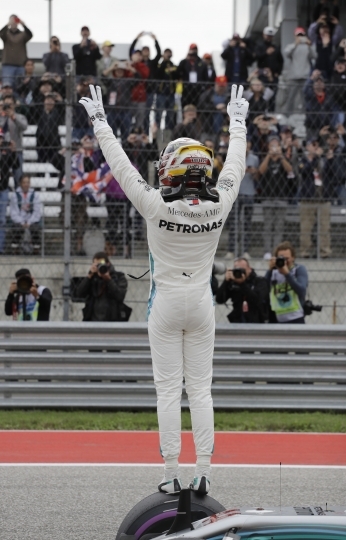 Hamilton leads Vettel by 67 points and any result Sunday that puts him eight or more points ahead of Vettel clinches the title. If Hamilton wins, Vettel must finish no longer than second to keep the championship alive next week into the Mexican Grand Prix. A fifth title would tie the British driver with Argentina's Juan Manuel Fangio, who won five championships in the 1950s. Germany's Michael Schumacher holds the Formula One record with seven. A win Sunday would also be Hamilton's 10th of the season. He's won on this track five of the last six years. Hamilton refused to get into predictions about Sunday's outcome. "We've not been getting ahead of ourselves," Hamilton said. "We have to do the same work as before." Vettel criticized the penalty when it was assessed on Friday, but he refused to rehash his frustration after qualifying. "I can't change that now. It is was it is," Vettel said. Vettel is also a four-time champion and he began the season with consecutive wins in Australia and Bahrain. 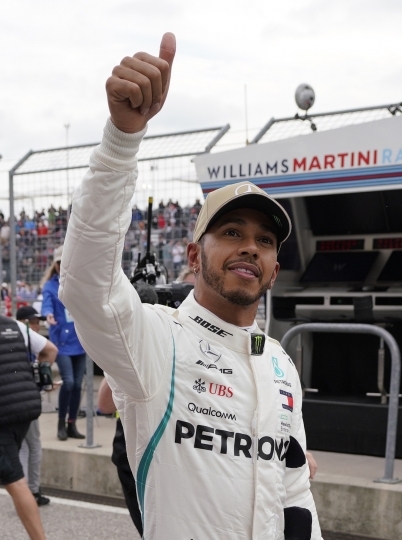 The title chase swung to Hamilton when he won six of the last seven races. Vettel has one victory and missed the podium three times in that span. Vettel won here in 2013 and is the only driver to beat Hamilton at the Circuit of the Americas since it opened in 2012. He at least knows his car has the muscle to compete with Mercedes again. 'It was a bit of a surprise to see how competitive we are today given how far we've been the last few events," Vettel said. Starting between Hamilton and Vettel will be Ferrari's Kimi Raikkonen, Mercedes' Vallteri Bottas and Red Bull's Daniel Ricciardo. Getting around that group and still keeping Hamilton close will be difficult. Mercedes Team Principal Toto Wolff said this week he could use team orders to help protect Hamilton to win the title. Red Bull's Max Verstappen, who finished on the podium in three of the previous five races, will start 13th after he damaged his car in the first round of qualifying. Verstappen broke his suspension when he hit one of the new curbs installed on turn 15. Nicknamed "Verstoppen," the curbs were installed to prevent the sort of illegal pass Verstappen used last year to get by Raikkonen on the final lap. "Something's broken!" Verstappen radioed to his team before slowing bringing the car back to the garage. "Max likes to use a lot of the track, as you know from history here," Hamilton said.